To Cite: Ramezani-Binabaj M, Motalebi M, Karimi-sari H, Rezaee-Zavareh M S, Alavian S M. Are Women With Polycystic Ovarian Syndrome at a High Risk of Non-Alcoholic Fatty Liver Disease; A Meta-Analysis, Hepat Mon. 2014 ; 14(11):e23235. doi: 10.5812/hepatmon.23235. Context: Insulin resistance is a hallmark of metabolic syndrome (MS). It has been proposed that both polycystic ovarian syndrome (PCOS) and nonalcoholic fatty liver disease (NAFLD) are correlated with Insulin resistance. Therefore, PCOS and NAFLD can be attributed with insulin resistance and therefore MS. The aim of this meta-analysis was to determine whether PCOS patients are at a high risk of NAFLD. Evidence Acquisition: Google scholar, Scopus, ISI Web of Science, Embase, MEDLINE, and some Iranian databases such as scientific information database (SID), IranMedex, and MagIran were searched to identify relevant studies. We included all papers regardless of their language from January 1985 to June 2013. By using data on prevalence of NAFLD in patients with and without PCOS, odds ratio (OR) with 95% confidence intervals (CIs) were calculated in each study. Chi-squared test was used to assess heterogeneity between studies. Results: We finally included seven eligible studies. According to chi-squared test, there was a significant heterogeneity (73.6%) between studies (P = 0.001). NAFLD prevalence was significantly higher in patients with PCOS compared to healthy control, with an overall OR of 3.93 (95% CI: 2.17, 7.11).There was no significant publication bias based on Begg's and Egger's tests. Conclusions: According to the results of this meta-analysis, there was a high risk of NAFLD in women with PCOS. We suggest evaluating patients with PCOS regarding NAFLD. Nonalcoholic fatty liver disease (NAFLD), as one of the most common reasons of chronic liver disease in western countries, is characterized by accumulation of fat in hepatocytes without presence of significant consumption of alcohol (1, 2). This disorder includes a simple steatosis, which can progress to non-alcoholic steatohepatitis (NASH). Patients with NASH can also develop liver fibrosis, cirrhosis, and even hepatocellular carcinoma (HCC) (2). A powerful correlation between NAFLD and insulin resistance has been proposed. This correlation may play a prominent role in the pathogenesis of NAFLD (1, 3). By considering insulin resistance as a hallmark of metabolic syndrome (MS), NAFLD can be considered as hepatic component of MS (4-7). Another disease with a powerful association with MS is polycystic ovarian syndrome (PCOS) (1). PCOS as the most common endocrine disorder among women at child bearing age (affecting up to 10%) is characterized by hyperandrogenism and ovulatory dysfunction. hirsutism, acne, and androgenic type of alopecia are common clinical presentations of hyperandrogenism and ovulary dysfunction can be expressed with oligomenorrhea or amenorrhea (2, 8). Although, a higher frequency of dyslipidemia, impaired glucose tolerance test and diabetes mellitus (DM) has been reported in these patients, indicating the association of this disease with MS (2). Approximately 50% of patients with PCOS have insulin resistance and therefore can be considered as patients with MS (1). It is concluded that PCOS and NAFLD can be coincident via insulin resistance and therefore MS (9). On the other hand, some original studies showed that NAFLD is common in patients with PCOS (4, 8-10). Screening patients with PCOS for NAFLD is an issue of debate. Therefore, we performed a meta-analysis to provide a clear and exact answer for this question that whether patients with PCOS are at a higher risk of NAFLD. An electronic literature search was performed using key terms of "PCOS", "NAFLD" and "insulin resistance", and all their synonyms in Google scholar, Scopus, ISI Web of Science, Embase, MEDLINE and some Iranian databases such as scientific information database (SID), IranMedex and MagIran. Two investigators separately did all of searches and quality assessment procedures and any disagreements between them were resolved by the third author. We included all papers regardless of their language from January 1985 to June 2013. We also searched Cochrane library especially for clinical trials registry to ensure minimum publication bias. 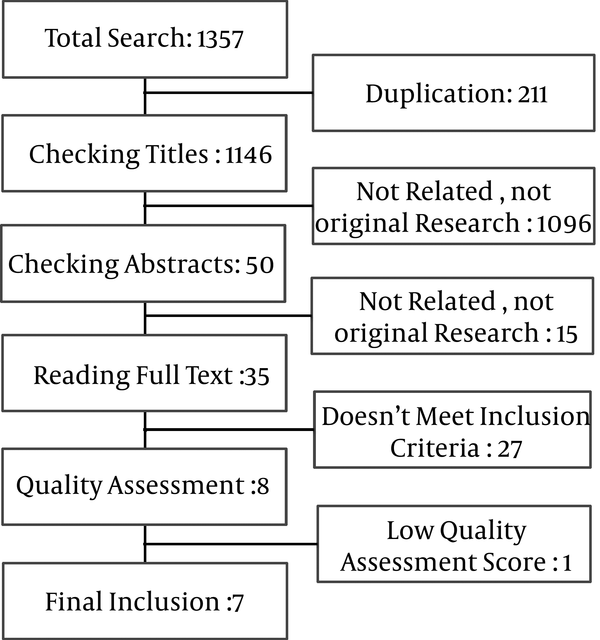 In addition, all of references of relevant review studies were checked to find further investigations not found before in primary electronic search. Quality assessment was performed using the STROBE Statement (11), a checklist that evaluates observational and report studies. This checklist evaluates 22 items. Each item has one score and a total score of 22. The studies were evaluated by two reviewers. The scores were optimized together, and if the scores were different more than 10%, reviewers negotiated in a similar score. After evaluating studies, Information was extracted from each study and imported to Microsoft Office Excel 2010 Software including first author's name, publication year, country, study design, diagnostic method of NAFLD and PCOS, sample size of PCOS and control groups, quality assessment score and prevalence of NAFLD in patients with and without PCOS. By using data regarding the prevalence of NAFLD in patients with and without PCOS, odds ratio (OR) with 95% confidence intervals (CIs) were calculated in each study. Chi-squared test was used to assess heterogeneity between studies. P value ≤ 0.1 represented a significant heterogeneity. According to the result of heterogeneity test, we used random Mantel-Haenszel model (in case of heterogeneity) or fixed Mantel-Haenszel model (in case of homogeneity) to achieve pooled OR. Publication bias was checked statistically using both Egger regression and Begg-Mazumdar tests, and a P value less than 0.05 was considered as significant publication bias. We also checked the funnel plot figure visually for publication bias. All analyses were performed with STATA software version 11 for windows. A total of 1357 manuscripts were obtained in online search in different databases. After that, 211 duplicate papers were excluded. Initial assessment with checking the title of articles led to excluding 1096 other manuscripts because of being not an original research, appropriate manuscript or related titles. Next, in abstract evaluation, 15 manuscripts were found to be not related or an original article. We read 35 full papers to check the studies for inclusion criteria. From these studies, 27 did not meet the inclusion criteria. Besides, one manuscript was excluded after quality assessment. We finally included seven well quality investigations (Figure 1). We included seven investigations from six counties, which provided data on the prevalence of NAFLD in patients with and without PCOS. Two studies from China and one from each of Athens, Chile, India, Egypt, and Brazil. In total, 42.5% of studies were from Asia, 28.5% from the America, 14.5% from Africa and 14.5% from the Europe. There were four case control studies (57.1%), two cohort studies (28.5%) and one cross-sectional study (14.2%). One study was published in 2007, one in 2008, two in 2010, two in 2012 and one in 2013. 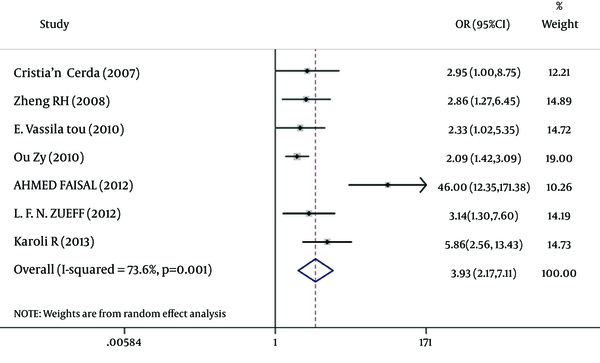 Table 1 shows the characteristics of the investigations enrolled in this meta-analysis. Age, BMI, LDL, HDL, and TG were available in five studies (1, 2, 4, 8, 9). ALT and AST were measured in four studies, alkaline phosphatase in only one study (9), and fasting insulin in five studies (1, 2, 4, 8, 13), with overall mean values shown in Table 2. In addition, Table 3 shows data on prevalence of NAFLD in patients with and without PCOS. a Abbreviation: PCOS, Polycystic Ovarian Syndrome; QAS, Quality Assessment Score. a Abbreviation: PCOS: Polycystic Ovarian Syndrome; BMI: Body Mass Index; ALT: Alanine aminotransferase; AST: Aspartate aminotransferases; LDL: Low-density lipoprotein; HDL: High-density lipoprotein; TG: Triglyceride. b All amounts are mean ± Standard deviation. a Abbreviation: PCOS: Polycystic Ovarian Syndrome; NAFLD: Non-Alcoholic Fatty Liver Disease. According to chi-squared test, there was a significant heterogeneity (73.6%) between studies (P = 0.001), so in a random method overall OR was 3.93 with a 95% CI of 2.17-7.11 (Figure 2). There was not a significant publication bias based on the Begg's and Egger's tests (Tables 4 and 5). 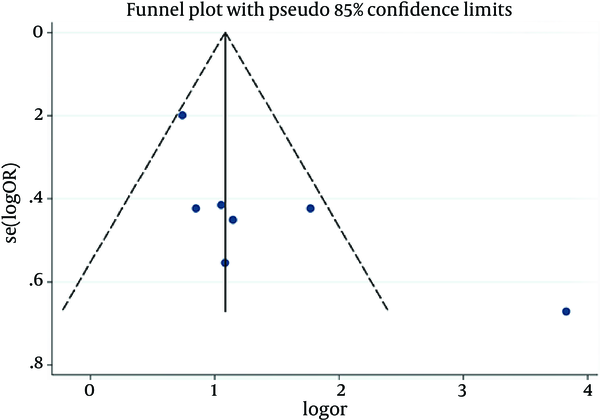 In addition, Funnel plot (Figure 3) was relatively symmetric, which suggested no publication bias. NAFLD refers to a spectrum of liver damage ranging from simple steatosis to NASH, advanced fibrosis and cirrhosis (14). NAFLD is a condition of accumulation of fat, which exceeds 5% in hepatocytes. NAFLD primarily results from insulin resistance, and thus frequently occurs as a part of metabolic changes of obesity, type II diabetes, and dyslipidemia. Estimated prevalence of NAFLD in general population ranges from 3% to 24% (15), while different studies detected a higher prevalence of NAFLD in PCOS as the most common endocrinopathy affecting women of reproductive age (1, 2, 8). The aim of this meta-analysis was to determine whether patients with PCOS are at a high risk of NAFLD. Women with PCOS are at a substantial risk of developing metabolic abnormalities such as glucose intolerance, dyslipidemia and MS (16, 17). Prevalence of MS in women with PCOS is significantly higher than age-matched counterparts from the general population. More recently, a link between PCOS and NAFLD has been demonstrated according to their some same etiology such as obesity and insulin resistance (18-21). We found that patients with PCOS had a 3.93 fold increase in the risk of coexist NAFLD (95% CI: 2.17-7.11). This increased risk of NAFLD in patients with PCOS is due to their same etiology. On the other hand, the prevalence of NAFLD in women with PCOS varies in different countries. The prevalence of NAFLD in Chinese women with PCOS was 32.9% (22), 55% in the American women, 41.5% in Chilean women (1, 23) and 73.3% in Brazilian women (8). It seems that these differences are related to genetic, ethnicity and specially lifestyle such as food habits and exercise. Several investigations proved that lifestyle modification could reduce MS prevalence and severity (24, 25). Both PCOS and NAFLD have high prevalence in obese women. Angolo in his review stated that American ethnic group, central obesity, type II diabetes, hyperlipidemia and hypertension are risk factors of NAFLD (26). Qu et al. (22) reported that women with both PCOS and NAFLD had higher BMI compared to those without NAFLD. In addition, studies which reported a high prevalence of NAFLD in patients with PCOS stated higher BMI in their patients compared to those studies with lower prevalence of NAFLD. These observations showed that obesity is a main reason for coincident of NAFLD and PCOS. Many authors believed that NAFLD and PCOS are hepatic and ovarian manifestations of MS. The role of insulin resistance (IR) in PCOS and NAFLD has been evaluated in many studies (27-31). The prevalence of IR in PCOS plus NAFLD patients in evaluated studies was more than PCOS patients without NAFLD. Excess dietary fat, increased delivery of free fatty acids to the liver, insufficient fatty acid oxidation, and increased de novo lip genesis may lead to accumulation of fat in the liver. IR may enhance hepatic fat accumulation by increasing free fatty acid delivery and through the effect of hyperinsulinemia to stimulate anabolic processes (27). Insulin-sensitizing medications such as metformin had useful effects on NAFLD and PCOS (32, 33). Most common biochemical indexes in NAFLD patients are increased levels of alanine aminotransferase (ALT) and to a lesser extent aspartate aminotransferase (AST). ALT is a more sensitive biomarker than AST for impaired insulin signaling and NAFLD (34, 35). Furthermore, it had been demonstrated that NAFLD is the most common cause of persistent elevated serum ALT level in general population of Iran (36). Our study had some inevitable limitations. Although ultrasonography (US) is usually used to diagnose NAFLD in clinic, liver biopsy is the gold standard method (37-39). Since US had been used in evaluated studies as a diagnostic method for NAFLD as a high sensitive method, it can overestimate prevalence of NAFLD. Another limitation was the small sample size in the evaluated studies, so we could not perform any subgroup analysis. In conclusion, according to the results of this meta-analysis, there is a high chance of NAFLD in women with PCOS. We suggest evaluating patients with PCOS regarding NAFLD. In this regards, general physicians have an essential role, because patients refer to them firstly. We suggest evaluating BMI, liver function test and other risk factors such as diabetes mellitus in patients by general physicians and referring them to a gastrointestinologist in case of any risk factor. Authors’ Contributions: Ramezani Binabaj M made an electronic literature search. A critical appraisal (CA) was performed by Karimi Sari H, Motalebi M and Ramezani Binabaj. M. Rezaee-Zavareh M and Karimi Sari H analyzed the data. All authors contributed in interpretation of results. Alavian SM read the manuscript and supervised the team. 9. FAISAL A, GADALLAH AN, ZYITON A, ESKANDER A. Liver Affection in Polycystic Ovary Syndrome (PCOS).